Blockchain and Distributed Ledgers are the underlying technologies of cryptocurrencies like Bitcoin and Ethereum, but also enable many other uses that depand on immutable information and executable code – ‘smart contracts’. The seminar provides students with a profound understanding of the economic incentives and the legal structures underlying blockchain applications in business and in law. Academic classes alternate with lectures by practitioners from business and law firms as well as government institutions, all applying blockchain technology. A three-hour basic programming workshop will provide a first-hand experience in the technical background of blockchains and ‘smart contracts’. 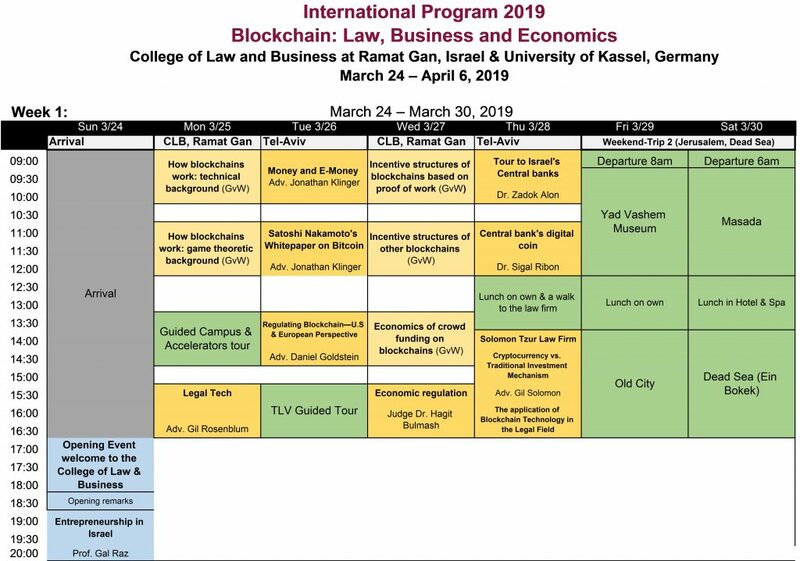 The seminar is organized by the College of Law and Business in Israel and the University of Kassel in Germany, and will take place in Tel Aviv metropolitan area, one of the world’s most innovative start-up cities. In addition to the academic lectures, the course will include touristic and study tours. We invite advanced bachelor and master students from law, economics, business and related fields to participate in the interdisciplinary seminar. 390 Euros which includes tuition, study tours and the first tourist weekend to Jerusalem, Masada and the Dead Sea and tourist and study tours. The price dose not includes flight tickets, accommodation*, local transportation and personal expenses. There are many accommodation services in Metropolis Tel-Aviv, with different price range, from 30€ per night. Professional study tours – Visit leading Law Firms, Central Bank, Israel’s Supreme Court, the Israeli Parliament (“The Knesset”) and meeting with government officials. Jerusalem: Tour Of History – Visit “Yad Vashem”, The World Holocaust Remembrance Center, followed by Guided tour to the old city of Jerusalem with its ancient sites. Tel Aviv Night Out – Going out to the vibrant bars that the city that never sleeps has to offer. Floating at the lowest point on Earth – Guided tour to Masada fortress and the Dead Sea, where you can float on the salty water, and enjoy lunch and spa at a beautiful Hotel.